Mystery solved. 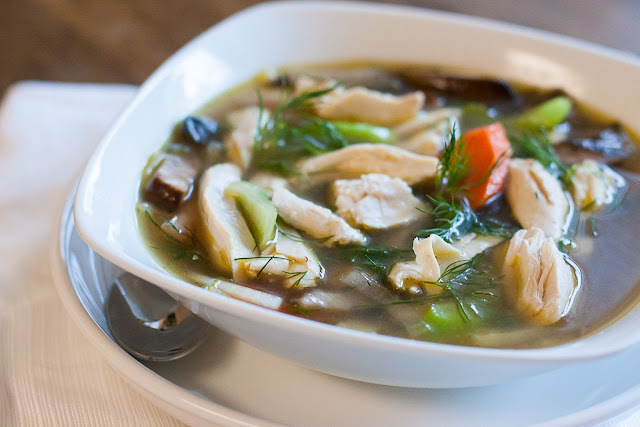 There are two elements required to make the perfect bowl of chicken soup: lots of fresh dill and a homemade broth. Fresh dill is, for lack of a better word, amazing. It literally transforms this chicken soup in to a noteworthy experience. Each slurp fills your mouth with a fresh burst of dill followed by silky and savory hot broth. There are a few tricks to making a great broth, which I will share with you here. What it boils down to (no pun intended) is patience and a little love. This soup is worth it. Tip #1: collect the ends of carrots, celery, fennel, and/or other root vegetables throughout the week, and save them in a large Ziploc bag in the freezer until the bag is full. the more veggies the more flavorful your broth will be. Fennel is a must. Tip#2: Save the carcass of rotisserie chickens or chicken "scraps" in the same manner. I like to have at least two chickens worth in the freezer before I make broth. Some recipes suggest roasting chicken before making broth which is why I save rotisserie chicken scraps. Roasting the bird really does give the final product a more refined and smoky taste. Waste not, want not. Tip#3: For a clear broth, peel the onion. For a deeper color, keep the peel on. I always keep the peel on. Tip#4: Always simmer, never boil. Boiling makes for a cloudy broth. Tip #5: Following these tips without the chicken also makes the perfect vegetable broth. Place both carcasses, 5 quarts water, halved onion, 2 whole garlic cloves, reserved frozen vegetables, 2 bay leaves, parsley sprigs, and thyme sprigs in 8-to10-quart pot. Bring to a simmer. Reduce heat. Simmer 1 1/4 hours. Strain broth; return to pot and simmer until reduced to 7 cups. Turn down heat to low. Add chicken breasts; poach until cooked through. Remove chicken from broth and allow cooling; straining broth and setting aside. Shred chicken breast; reserve on side. Heat oil in another large pot over medium-high heat. Add sliced onion, sliced garlic, and 2 bay leaves; sauté 2 minutes. Add sliced carrots, celery, mushrooms, 1 teaspoon sea salt, and 7 cups broth; bring to a high simmer. Reduce heat and simmer until vegetables are tender, about 15 minutes. Add shredded chicken; season with more salt and pepper. Garnish with a lot of fresh chopped dill. That's how I do my broth too - veggie left overs are the best! I also add jalapeno. Mmmm! I do agree that broth is the key for great soups, also some herbs. I have dill in my garden, therefore this lovely soup is going on my table for this weekend. What a beautiful bowl of soup this is! I have never even thought about adding dill to mine! Dill is just amazing in this soup. I can't wait to hear if you like it!